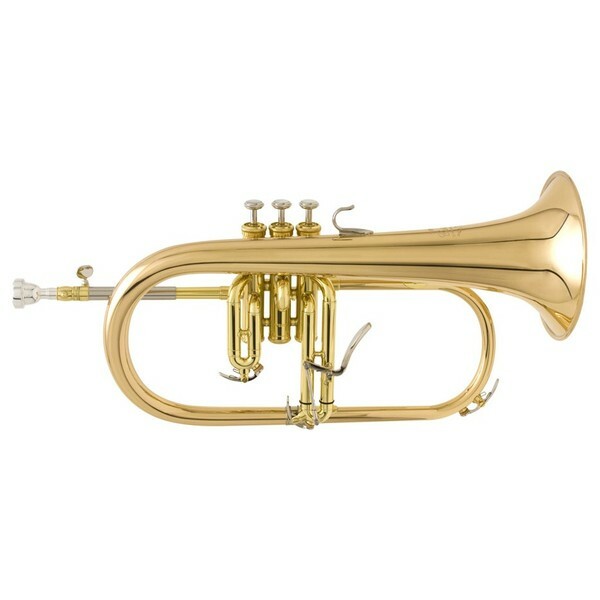 The Yamaha YFH8315G Professional Flugel Horn features a brand new design based on the traditional smaller bore which is favoured by many players around the world. A redesigned third valve slide trigger now accommodates a wider range of hand sizes and improved comfort for all. The YFH8315G features traditional vertical valve tubing. Also included in the design are monel pistons which are resistant to corrosion, helping the instrument to retain precise fit and smooth action for many years. Hand-lapping pistons and slides help to achieve a precise fit and seal of the pistons and casing, resulting in smooth air flow and actions, as well as an improved response and intonation. The YFH-8315G features a brand new design and developed mechanisms. To accommodate a wider range of hand sizes, Yamaha has redesigned the third valve slide trigger. Now more efficient than ever the slide is comfortable to use for all. The YFH-8315G comes with monel pistons which are perfect for professional players as they resist corrosion, retaining their precise fit and smooth action for years. The hand-lapped pistons and slides ensures a perfect fit and seal between the casing and the pistons, for a smooth air flow and action, as well as an improved response and intonation. Gold brass is popular among orchestral players, for its ability to achieve much darker sounds than yellow brass can. This is because gold brass contains a higher amount of copper than yellow, delivering a high level of projection, and a broader, fuller tone. The YFH-8315G Flugel Horn comes equipped with a FHC-8315G case which is ideal for travelling players. Whether you're going to school, rehearsal, gigs or concerts, this case will protect your instrument from scratches and knocks, keeping it looking, feeling, and sounding like new for longer. As well as this, this stunning flugel horn also comes with a 14F4 mouthpiece.